Germany's Christmas markets are famous the world over. 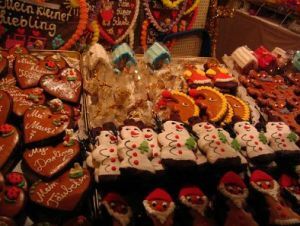 You are spoilt for choice in Munich, which has about 10 main Christkindlesmärkte spread throughout the city. Each one has its own flavour so you could easily pass a couple of days just exploring the food, gift stands and attractions at each of them. Take a look around for yourself and maybe you'll discover the best Christmas Market Munich has to offer. Here's a quick guide to the highlights of the Munich Christmas Markets. Make sure the purses or wallets are full, this is the perfect place to stock up on gifts for Christmas day. There are decorations, star-shaped lamps, carved nutcrackers, clothes, picture books, handmade candles, soap, handicrafts, you name it. Wooden mangers (Krippel) are especially popular. Most German families keep them to decorate their living rooms for Christmas. There are also hundreds of manger decorations available, from tiny wooden baby Jesus', to sheep and kings bearing gold, frankincense and myrrh. There is even a special market devoted to mangers, the Kripperlmarkt on Rindermarkt just south of Marienplatz. Here's a map showing the locations of the Munich Christmas markets mentioned below. Why not take a little tour and discover a couple of them? Christmas market cuisine is simply a world unto itself. Gorge yourself on a half-metre sausage or stroll around with a paper cone full of mouth-watering nuts. Oh my god, did I really write that? ▪Wurst - Sausages of every shape and ethnicity are on offer - from the diminutive Nürnberger Würstchen, to classic bratwurst, to the mammoth, spicy, half-metre Feuerteufel (fire devil). ▪Dampfnudeln - This is a light, steamed dumpling often coated with vanilla custard. You can get it with a berry filling if you wish. ▪Chocolate-coated fruit - This comes served on sticks and just screams out at you to take a bite. Choco-bananas, choco-strawberries and choco-peaches are all there. ▪Lebkuchen - Gingerbread cookies never tasted better than at a Christmas market. They say the best stuff comes from Nürnberg (Nuremberg) in northern Bavaria. ▪Magenbrot - Another type of gingerbread, the name means "stomach bread". A great tummy filler. ▪Plätzchen - The quintessential baked Christmas cookies. They often come mixed in a bag, tops for snacking. They often feature ingredients like nougat, berries, chocolate or almonds. ▪Gebrannte Mandeln - Roasted chestnuts, coated with spices, sugar or chocolate. Simply delicious, this is the enticing smell that permeates over the Christmas markets. It's all about the Glühwein. This spicy nectar is the main reason many people come to the Christmas markets at all. It's not only because of the alcohol content, the way a cup of the stuff warms up your fingers, or the taste of the spicy red wine it embodies. It's all of those things, and the feeling of cosiness you get from huddling around with friends holding hut mugs, even though it's totally freezing outside. A cup of Glühwein costs about €2. It's normal to pay double that when you receive your drink, the other half is for the deposit (Pfand) which you can pick up when you return your mug to the stand. You can, of course, just keep the mug, they make great souvenirs. Staying off the booze? Don't let the name put you off but the Kinderpunsch (Children's punch) is the most popular non-alcoholic option at your average Christmas market in Munich. 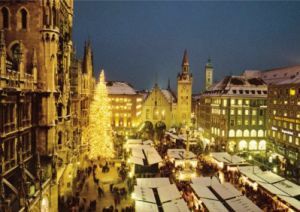 The biggest and most commercial Christmas market is on Marienplatz, with hundreds of stands and a great big Christmas tree. From this Christmas market you can watch daily musical performances from the balcony of the Neues Rathaus (New Town Hall) at 5.30pm. Open November 26 to December 24, weekdays 10am-8.30pm, Saturday 9am-8.30pm, Sunday 10am-7.30pm. December 24 10am-2pm. This really isn't the best Christmas market in Munich though. It's overcrowded, expensive and just too darned big whereas a good Christmas market should feel a little cosy. Try and explore some of Munich's other markets, particularly those mentioned below. Duck under the archways of the Neues Rathaus and through to the inner Prunkhof courtyard. There you'll find the once-a-year Christmas market post office. The Deutsche Post will stamp your envelopes and parcels with a special edition "Christkindl" stamp. Open: Weekdays 12pm-6pm, weekends 10am-7pm. In Bavarian tradition Santa Claus (the Weilnachtsmann or Sankt Nikolaus) isn't the only character who runs around visiting kiddies in December. He also has a dirty little friend called Grampus. Grampus dresses in black and carries a big bundle of sticks. He's there to scare the children who've fallen into the "naughty" column. But of course he doesn't actually spank anybody, it’s all just a bit of good old pagan fun. 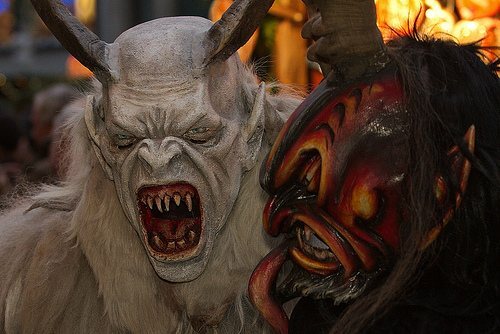 On December 6 and December 20 Santa's meanie helpers (many dressed up as grotesque demons) have a "Krampus run" around a few Munich Christmas markets, especially the one at Marienplatz. It's worth seeing for the costumes alone and takes place from 4.30pm to 5.30pm. 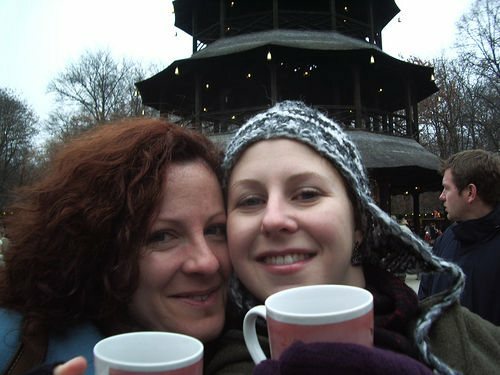 One of Munich's nicest Christmas markets is at the Chinesischer Turm (Chinese Tower) in the Englischer Garten. December 7 and 14 are special "children's days" when the little ones receive gifts from a jolly Santa. Open: November 28 to December 22, weekdays 12pm-8pm, weekends 1am-8pm. Munich's old southern city gate hosts a spectacular Christmas market that lights up beautifully in the evenings. Blind musicians belt out Silly Season hits on weekends from 5pm to 7pm. Open: November 25 to December 23, daily 10.30-9pm. The Christmas market in Munich's former Bohemian quarter keeps a cool flair. There are over 100 one-person stands and a focus on unique handcrafted gifts. There are also daily live musical performances and vendors offering cuisine from around the world. It's just next to the Münchener Freiheit U-Bahn station to the north of the city centre. Open: November 26 to December 24, weekdays 12pm to 8.30pm, weekends 11am-8.30pm, December 24 (Heiligabend) 11am-2pm. The "middle-ages" Christmas market on Wittelsbacherplatz is one of the more unusual of the Munich Christmas markets. This market attempts to throw you back to the age or knights, damsels and jesters. There are regular fire shows, dance lessons and displays of wizardry. Open: November 25 to December 23, daily 11am-8pm, see website here. you'll find the Christmas Village (Weinaachtsdorf) inside the Kaiserhof courtyard of the Munich Residenz, just off Odeonsplatz. 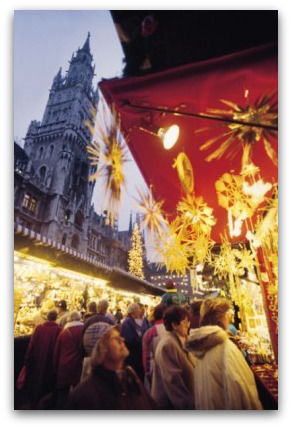 It's Munich's second biggest Christmas market and features traditional craftsmen's works. There is also regular live music to keep the shoppers bopping along. Open: November 25 to December 23, daily from 11am to 9pm, see website here. This Christmas market prides itself on its fine craftworks and entertainment for children. It's on an island in the Isar River near the major Maximilian Strasse shopping mile. Open: November 26 to December 23, weekdays 3pm-10pm, weekends 11am-10pm. A little bit out of the centre, this huge and truly suburban Christmas market has a great program of music and puppet shows on the weekends. Open November 26 to December 23, daily from 11am to 9pm. This isn't technically one of the Munich Christmas markets but it's very much one in spirit. The winter Tollwood festival excels in art and world culture, and has a "Market of Ideas" with food and handicrafts from the world's four corners. There will be a few big marquees feature live music and other performances. It's at the Theresienwiese, where the Oktoberfest also takes place. In my opinion it's the most funky Christmas Market Munich has to offer. Open: November 24 to December 31 (market only open until December 23), weekdays 2pm-1am, weekends 11am-1am. Like to see more photos from Munich Christmas Markets? Just click forward! Like to book a guided tour? • See here for a story on German Christmas Traditions. • See the main Munich Attractions page. A few years ago I wrote a story about what it would be like to open your own Christmas market stand in Bavaria, which was published on The Local Germany news website.Click here to read the story.